Return with us now to the problem of convincingly writing and/or portraying one-dimensional, dumbed-down characters without being mistaken for dumb oneself. It's a difficult trick to pull off. Case in point: writer-director Aaron Katz's doomed whodunnit Gemini. 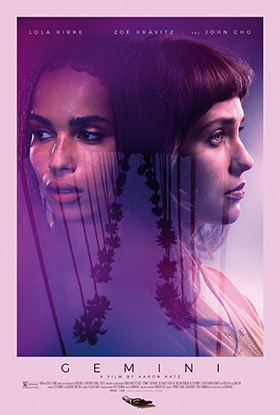 Jill (Lola Kirke) is the personal assistant to Heather (Zoë Kravitz), a movie and pop-music star. As such, it's part of Jill's job to drive Heather around Los Angeles, listening to her prate on about her social media presence and which karaoke bar to go to next. Their conversations are a veritable festival of glottal fry and girlish giggles, not helped along in the least by Katz's dialogue. Anxious Heather is in the midst of a career hiccup in addition to boyfriend problems, and so when the pair returns to Heather's mansion late one evening, the talk naturally turns to firearms. "You have a gun, right?" Jill's woozy boss asks her. "Can I borrow it? So many crazy people are mad at me." We can visualize the corpse, shot five times with a .22 and lying in a pool of blood, several long minutes before it actually appears on screen. The setup is noirish in the extreme, the milieu somewhat less so, but the follow-through is embarrassing to watch. Each and every one of the characters is bland and shallow as only stereotypical movie-biz folks can be, but that's a minor distraction compared to the poverty of the writing. There are so many things the scenario could have Jill do as the voiceover fulcrum of the piece, but she never does any of them. Once we get past the first fifteen minutes, the story is distressingly light on narrative incident. There are too many clichés to accurately count; although, in fairness, at least no one misuses the word "literally." Other films – notably Sofia Coppola's The Bling Ring – have made satirical fun of vain young Southern California women like Heather and Jill, but with a keen, sharp-witted joie-de-combat that's completely lacking in Gemini. As for the murder mystery, everyone involved other than LAPD Detective Ahn (John Cho) seems to be completely uninterested, so why should we be any different? After all, everybody is guilty of something. Filmmaker Katz's last theatrical release was 2014's Land Ho!, a low-key character study – estranged brothers-in-law reunite while touring the volcanoes and glaciers of Iceland – that had the carefully etched personality the newer film lacks. Kravitz (Rough Night, Mad Max: Fury Road) is capable of better than this. UK native Kirke we're not quite so sure about, but on the evidence of her work in Mistress America, she's ready to do more than just flit through K-Town and the requisite mid-century modern hilltop house in a blond wig. Speaking of which, we heartily recommend Thom Andersen's masterful 2003 documentary film essay Los Angeles Plays Itself, which points out most of the pitfalls Katz, Jill, Heather, and their friends tumble into, depicting sights and motivations in the Valley of the Smokes. Those endless palm trees and Keegan DeWitt's boingy electronic freeway-cruising music track only reinforce the corniness of Gemini's Los Angeles.